Since starting my company over a decade ago, I’ve observed several types of bidders. In this post, I’m describing my live auction bidder archetypes. These are a tad tongue-in-cheek. Even so, I suspect you’ll recognize some of your guests from among these descriptions. 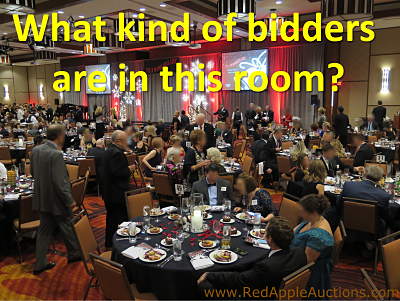 Remember that most guests at your gala are not going to participate in the live auction. Usually just 10% to 20% of your crowd is active in the live auction; the rest of your guests are observing and/or socializing. If your live auction is fewer than 5 items, these percentages drop even further. Keeping that in mind, here are my archetypes for those bidding. Buyers are taking the item home, regardless of price. They might start the bidding, or jump in to bid as it’s being sold, but they. are. taking. it. home. Some of these buyers will force prices higher, just because. For instance, I might be asking for $7000, and the Buyer Archetype shouts “$10,000!” That kind of participation often garners cheers from other guests and shuts down the competition. These bidders have intent to buy and often do buy the item — but not always. IITWI bidders aren’t afraid to start the bidding and painfully leave the bidding only after the price simply becomes too high to bear. They often bid more than they wanted, just because they were so committed to taking the item home. It’s with great consternation they stop bidding — and it’s usually because a “Buyer” archetype is bidding against them. I feel a little sorry for these bidders when they have to back out. I see IITWI bidders most often when I’m selling trips or items for or by their children. For instance, parents might have come to the auction specifically to buy their child’s class artwork project. These people will continue to bid a few bids beyond what they were prepared to pay, simply because they were so set on taking the item home. Once they lose, they look dejected. Sometimes IITWI bidders can be drawn into buying something else for their child, like a Principal for the Day experience. But their enthusiasm isn’t the same. Sympathizers don’t want to buy the item being offered. But if no one is bidding, they’ll bid simply because they feel sorry for the donor or organization. Starters will open the bidding on almost any item, but they don’t want to buy anything. They are merely helping the auction get underway. I worked one auction whereby a woman near the front threw her hand up on every item. She never bid a second time, but she was happy to help me start the bidding! Similar to Starters, Helpers don’t have a strong desire to buy anything, but they do want to drive bids up. If a Helper occasionally gets “stuck” buying an item (“stuck” would be their words, not mine), they’re OK with it. Because above all else, they’re not going to let an item be sold for cheap. In this sense, they are protectors of the auction. They believe in the group and want the event to succeed, and will ensure items sell for a respectable price. Opportunists are calculated bidders. I suspect they spend a lot of time at commercial auctions. They’ll wait until the last minute, swoop in, and buy the item. I think of them as Buyers who aren’t prepared to “overpay” for an item. Or they just like the feeling of getting a good deal. For instance, the Opportunist might see an item about to sell for less than what he perceives the value to be, so he’ll raise his hand to bid. Opportunists often only bid once — but it’s the last bid and they win the item. If I’m advancing the bids with $500 increments, a Negotiator will yell for a $250 increase instead. If I’m using $250 increments, he’ll shout out for a $100 increase. Most of the time I ignore Negotiators because the bidding is strong and I don’t need to think about using smaller increments. But sometimes I do take the Negotiators offer. When I take his bid, I make sure the crowd realizes what just happened. I put the Negotiator on the spot. Assume I’m at $1750 and requesting $2000. The Negotiator might shout $1800. I could accept his offer, get the competing bidder to bid $1900, and then return to the Negotiator, asking for $2000. I publicly point out that I was kind to him when he asked for a smaller amount — and now he needs to work with me keep the bidding moving. Usually I’ll get a Negotiator to bid one or two more times after doing that. It’s my thinking that the Negotiator was privately hoping to be an Opportunist. When that doesn’t work out and the item is selling for a higher price, it becomes too rich for the Negotiator’s comfort level. He drops out. Deal Makers appear during group package sales. If I’m selling an item that allows for multiple people to participate, such as a “dinner for 10” or “Italian villa for 4 couples,” you can identify the Deal Maker because he’s leaning forward, talking to his table mates. He’s working a deal, trying to pull bids together from his friends. Deal Makers are usually slow to bid because each time I increase the price, he has to go back to his constituency (his table mates) and “sell” the new higher number. Players don’t want the item, but they like it to appear as though they do. They might want to be a big shot in the room, without necessarily paying for the item. Some Players bid aggressively early on, when the price for an item is low and multiple hands are in the air for the item. But as the price increases, Players take longer to bid. He might pretend to weigh the worthiness of the item’s value before raising his hand. Another identifier of this archetype is that I rarely see Players talking to anyone else (such as a spouse) to get an opinion on whether he should bid again. Players can be … well … jackasses in this way. When I see this happening during a sale, I have a method of dealing with the Player publicly (in a nice way) that ensures he doesn’t try and complain later. And if he does, the audience is on my side the second time — not his. As you consider your crowd, have you identified some of these Live Auction Bidder Archetypes? If so, what types? Or what do you think I’ve missed?